Enable control and monitoring of landscape irrigation from anywhere with one easy to install, high-efficiency, and retrofittable system. 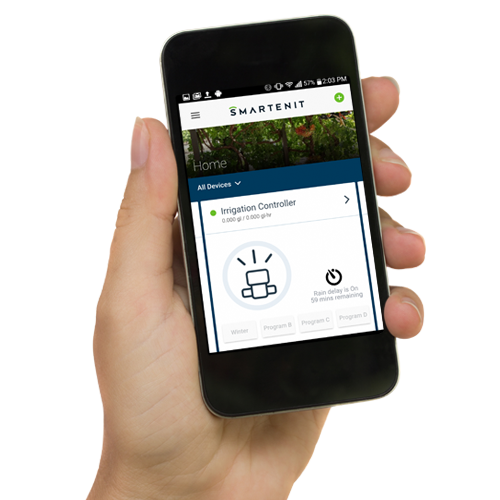 Controllable from a PC, or smartphone this solution enables beautiful landscapes and controlled vegetation, lower electric bills and water conservation. 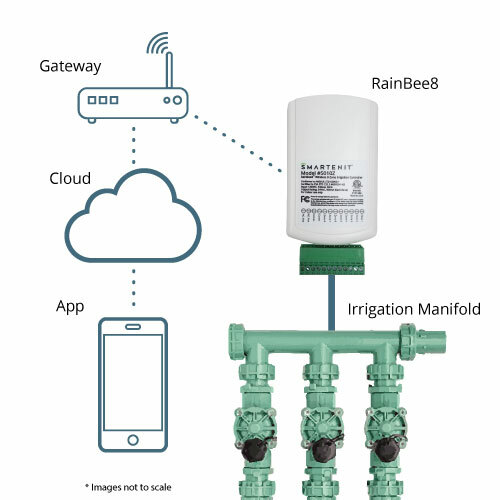 The system effectively couples weather, time and soil conditions for optimal convenience and savings..
A basic irrigation system consists of our ZigBee RainBee8 eight-zone controller connected wirelessly to our Harmony P2 gateway. Commonly available irrigation valves (zones) are wired directly to the controller via standard buried low-voltage cable. Our iOS or Android app connects to the gateway either directly when within the local premise, or through a cloud service from anywhere an Internet connection is available. The controller turns the valves on for preset times, or off, in response to commands from the gateway. Commands control specific valves, or trigger “programs” that activate a group of valves sequentially. The system is expandable and integrates with the rules engine in the gateway. A flow meter can be added to the system to meter the water consumption for a given schedule, and rules can be established to control behavior based on water consumption. Additionally, the system accommodates rain sensors and information from weather stations and soil sensors. A kit consisting of a RainBee8 a Harmony P2 gateway, and our mobile app is available for trying this an an out-of-the-box solution. Contact us for details. No more mysterious, hard to use box in the garage. Disable sprinklers when raining and set schedules based on locality use restrictions like odd/even days, and the actual vegetation needs, from the convenience of a voice activated device or a smart phone. Save water while enjoying beautiful landscapes and gardens. Facilitate enforcement of water restriction days and achieve water conservation goals without impacting user convenience. Establish incentive programs for water conservation while making subscribers aware of consumption. Encourage watering programs that adjust to seasonal conditions. Create new sources of revenue by offering landscape and garden value added services. 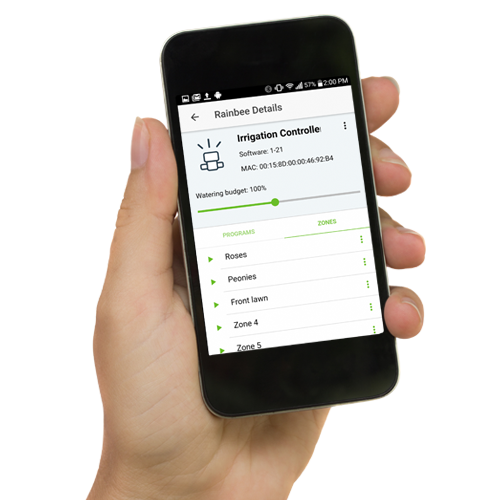 Remotely detect water breaks from broken sprinklers and shut down lines until service dispatch is convenient. Schedule watering based on landscape needs and adjust remotely when needed. Cut down on unscheduled repairs repairs.